Welcome to Autvivid online shop, this’s our seat catcher set series. If the product you received has quality problems or damaged due to logistics problems, please feel free to contact us, we’ll provide replacement for you. A side pocket with an additional coin pocket, got your coin & smartphone & wallet & cards inside one place. Easy to use and closer to your body. Place all your small stuffs such as smartphone, wallet, coins, keys, cigarette, etc. No more gaps between the console and the seat. Easy installation: Just put it between your seats, insert plywood inside the middle gap then you’ll get your items organized immediately! Welcome to our store.This is autvivid Side Pocket Catcher organizer. Fills the gap between consoles and car seats so you never loose another item under your seat. Helps prevents dangerous distractions and Keeps hard to reach areas clean. These Slide Seat Catchers will make it life in your car a little more convenient. Made of Premium High Quality PU Leather. 100% Satisfaction Or Money Back Guarantee! Catches items before they drop between seats, creates extra storage within easy reach. 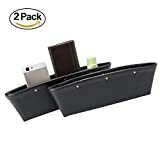 Universal Vehicle front Seat Catcher Slit Pocket Organizer. Large capacity receive a case. If you like it,please add it to cart.autvivid products will make you satisfied.